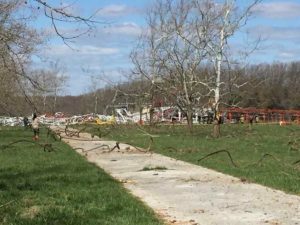 A television tower came crashing down this morning – killing one person in southwest Missouri’s Fordland. An assistant fire chief says six people were on the tower about 105 feet in the air when it collapsed. He tells Missourinet affiliate KTTS in Springfield that one person was killed, and others have minor injuries. The tower, which is owned by KOZK-TV, was used to broadcast KSMU radio and Ozarks Public Television. The National Weather Service also used the tower to broadcast weather radio updates. The tower stood 2,000 feet tall.